As we have already seen, circuits with sinusoidal excitation can be solved using complex impedances for the elements and complex peak or complex rms values for the currents and voltages. Using the complex values version of Kirchhoff's laws, nodal and mesh analysis techniques can be employed to solve AC circuits in a manner similar to DC circuits. In this chapter we will show this through examples of Kirchhoff's laws. Solving such a large system of complex equations is very complicated, so we haven't shown it in detail. Each complex equation leads to two real equations, so we show the solution only by the values calculated with TINA's Interpreter. There are four unknowns- I; IZ; VC1; VZ - and we have four equations, so a solution is possible. According to TINA's Interpreter's result. 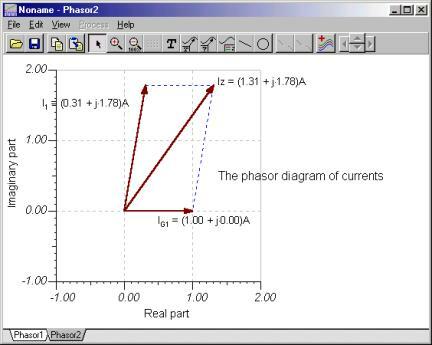 You can check Kirchhoff's current rule using phasor diagrams. 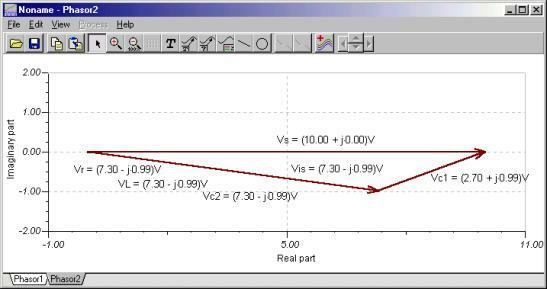 The picture below was developed by checking the node equation in iZ = i + iG1 form. The first diagram shows the phasors added by parallelogram rule, the second one illustrates the triangular rule of the phasor addition. Now let's demonstrate KVR using TINA's phasor diagram feature. Since the source voltage is negative in the equation, we connected the voltmeter "backwards." 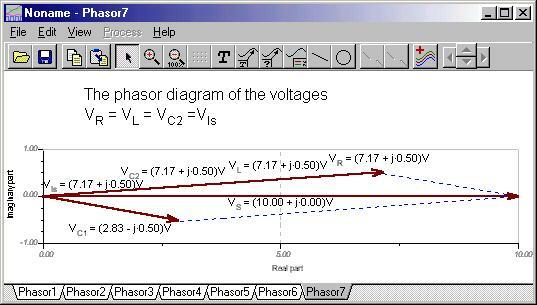 The phasor diagram illustrates the original form of the Kirchhoff's voltage rule. The first phasor diagram uses the parallelogram rule, while the second uses the triangular rule. 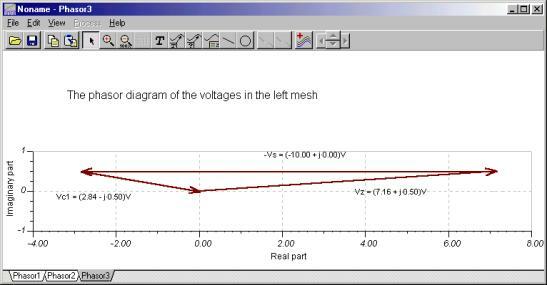 To illustrate KVR in the form VC1 + VZ - VS = 0, we again connected the voltmeter to the voltage source backwards. 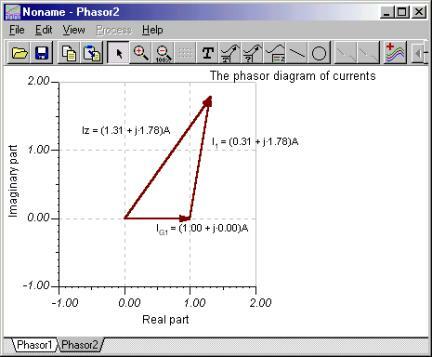 You can see that the phasor triangle is closed. Note that TINA lets you use either sine or cosine function as a base function. Depending on the function chosen, the complex amplitudes seen in phasor diagrams may differ by 90º. You can set the base function under 'View' 'Options' 'Base function for AC'. In our examples we always used cosine function as a base. C1 = 100 nF, C2 = 50 nF, R1 = R2 = 4 k; L = 0.2 H, f = 10 kHz. Now try to simplify the equations by hand using substitution. First substitute eq.9. into eq 5.
then eq.8 and eq.9. into eq 5.
then eq 12., eq. 10. and IL from eq. 2 into eq.6.